The vineyard is all hand pruned and handpicked with the fruit being chilled overnight in the Joyce cool rooms, before being transported to Pike’s Clare Valley winery for vinification. Traditional old world techniques as well as modern Australian winemaking are incorporated to produce a style which reflects the variety and region. 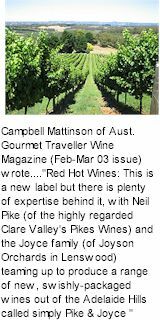 The Pike & Joyce range of wines has quickly become established as some of the Adelaide Hills finest, with the best yet to come. The Lenswood Adelaide Hills region produces wines of outstanding quality with distinctive character. The vineyards are some of the highest in the Adelaide Hills at approximately 500-550 metres above sea level, giving the wines excellent natural acidity. 100% owned by the Pike and the Joyce Family 18 ha (45 acres) planted in 1997/98. Lenswood represents a true ‘cool climate’ Australian wine region. Average rainfall is approximately 800mm-1000mm (32-40 inches). The steep sloping terrain reduces the risk of frost. The Lenswood gravelly clay loam soils drain extremely well. Steep north and east facing slopes. 2-m vine spacing. Trellis is treated pine posts 1.8m high with single cordon wire at 1m with two moveable foliage wires for vertical shoot positioning. Entire vineyard fitted with drip irrigation system. Irrigate only when necessary i.e. to keep vines functioning at their optimum levels to produce quality grapes. Hand spur pruning only, leaving an average of 30-40 buds/vine. Crop levels are on average 5-10T/ha (2-4 tonnes/acre). Grapes are hand harvested, chilled and transported to Pikes winery in the Clare Valley for vinification. The Winery Building is located at Pikes Vintners in the Clare Valley. Constructed of steel and local stone (also double insulated). All modern winemaking equipment including tank presses, crusher destemmer, must chilling facilities, temperature controlled 316 stainless steel storage and fermentation tanks. Grapes are hand harvested, chilled and transported to Pikes Vintners winery in the Clare Valley. Most fruit is lightly crushed and destemmed prior to pressing or fermentation. Some whole bunch pressing carried out on Chardonnay with most Pinot Noir being destemmed only. Minimal amounts of SO2 added in the vineyard to protect against oxidation in delicate white varieties (Pinot Gris, Sauvignon Blanc). SO2 added to Pinot Noir prior to maceration/fermentation. Pectic enzymes added to white varieties ex press, juice/must acid adjusted where necessary. Pure yeast cultures are added for delicate whites while most Pinot Noirs use wild yeast. Fermentation is carried out in small open vats with cap management by hand. All the Chardonnay has a natural ferment in barrel with solids. MLF occurs naturally in Pinot Noir and sometimes is inoculated in Chardonnay. Pinot Noir is matured in oak for 12 months prior to bottling and Chardonnay can have 10 months or so in barrel. Pike & Joyce use only Burgundy sourced 228L premium quality French oak barrels. Barrels are topped up once a month during most of the year. Chardonnay is racked only once (off lees) prior to bottling, while the Pinot Noir may have up two rackings prior to bottling. All whites are cold and heat stabilised prior to bottling. If fining is required PVP is the preferred agent. Membrane filtration is carried out at the bottling stage with the whites. The Pinot Noir is fined with gelatine (only if necessary) and minimum filtration if required. Pike & Joyce aim to produce wines that reflect their variety, region and vintage conditions. They are quite happy to watch over the wines during their formative stage and intervene only when necessary. Pike & Joyce produce the best wines they can from fruit their vineyards yield from any particular vintage.